The international network of the DGOI continues to grow: In July 2016, Q-Dent Academy, the Palestine association of dental implantology, joined the team of international cooperation partners of the DGOI. In cooperation with Jawad Ali Abu Tair, DDS, Hebrew University of Jerusalem, a Curriculum Implantology will be developed for the members of the Q-Dent Academy. The concept basically corresponds to the Curriculum Implantologie „8+1“ of the DGOI. 14 participants attended the first weekend of the curriculum in Baden-Baden/Germany at the HL Dentclinic of Dr Henriette Lerner in July. With great commitment, high concentration and the intense support by Dr Lerner, the dentists acquired the basics of dental implantology. The next course modules will be held in the home country of the participants. The last weekend of the curriculum as well as the final exam will take place in Germany on the 3rd and 4th of May, 2017. Professor Daniel Grubeanu, Germany, und Uli Hauschild, Italy, will be the lecturers on part of the DGOI. The DGOI is internationally engaged in continued professional education and training in dental implantology with the explicit aim of implementing improved dental standards for patients. 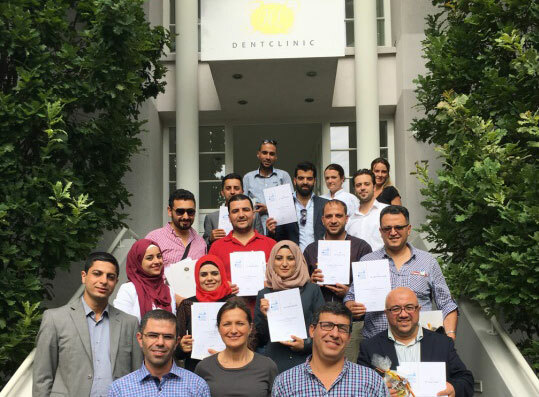 The opening module of the first Curriculum Implantology in cooperation with the Q-Dent Academy, Palestine, took place at the HL Dentclinic of Dr Henriette Lerner, Germany.